It's no secret  India loves SUVs. We love the size, the imposing presence and the ability to drive over broken roads without a second thought. But SUVs are also too large for some and too expensive for many others. And that's whee manufacturers like Volkswagen, Toyota and soon Fiat have identified a new market  compact, hopped up hatchbacks that offer visual connections to SUVs while retaining the compact size and pricing of a premium hatchback. Skoda actually pioneered the segment in India with the Fabia Scout but that car is now discontinued. The Cross Polo has been around for nearly a year now but it's still a rarity on the road. That's because Volkswagen doesn't really offer much more with the Cross Polo beside the rugged bumpers, ski rack, silver mirrors and different interior fabric. It's quite a subtle job and the Cross Polo doesn't look drastically different from its siblings. Beyond that you get the same car as a 1.2-litre highline diesel. Now this isn't a bad thing  the Polo offers plenty of features, a handsome cabin and good build quality in general. The issue is that Volkswagen asks for about Rs 70,000 more for a Cross Polo. And that's where it struggles to make a good buying proposition. Internationally the Cross Polo comes with higher ground clearance and bigger wheels, giving it a much more rugged and purposeful identity. The fact that none of this has made it to India is why we feel that the Cross Polo hasn't been a success. 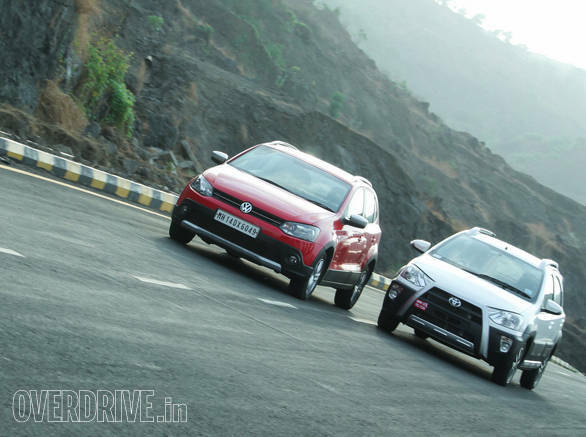 On paper, Toyota seems to have made the same mistake with the Etios Cross. It doesn't get big wheels or more ground clearance either. However, what Toyota seems to have done right is the body kit. It's big, bulky and with its new alloys, large spoiler and ski rack it attracts far more attention than the Volkswagen. 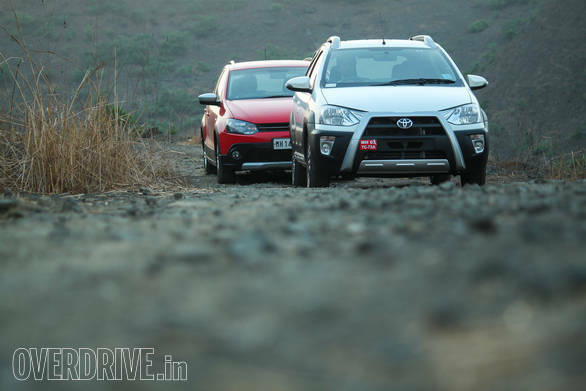 The Etios Cross looks far more rugged, even overtly so and thus looks substantially different from a standard Liva. In the two days we had the car I had plenty of people come up to me asking multiple questions  good signs for a new product. The Cross Polo meanwhile didn't get a second look. The Etios Cross gets a new piano black finish for the plastics on the dashboard. 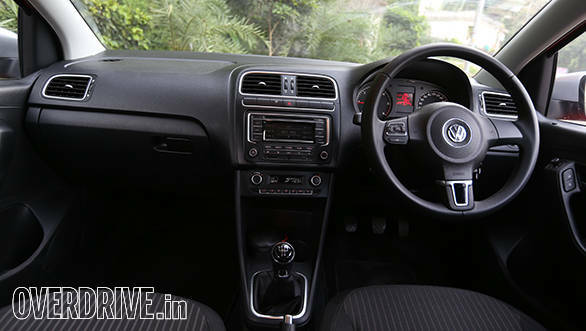 The interior looks far more digestible now compared to what we got when the Etios was first launched. Nevertheless it doesn't feel as premium as the Polo on the insides. The Toyota however scores in terms of space. It's far more spacious and comfortable compared to the VW which offers just about adequate room at the rear. The Volkswagen does however have more supportive seats, but both could offer better thigh support at the front and rear. The Polo has a larger boot but the Toyota's isn't bad either. The Cross Polo comes with just one engine, the 3-cylinder 1199cc diesel. The engine produces 75PS@4200rpm and 180Nm at 2000rpm. The engine feels refined for a three cylinder but still produces a loud thrummy note when revved. The engine revs freely which is a good thing because you need to cane this motor to get any real progress  low end torque is not a strong point. 0-100kmph takes a leisurely 16.1 s but the engine is pleasantly frugal returning an overall of 17.1kmpl. The Etios Cross comes with a choice of two petrols and a diesel. 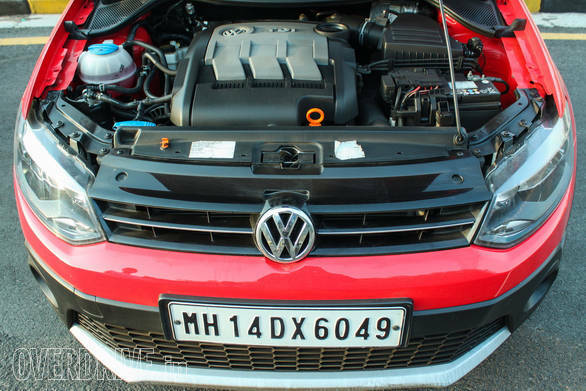 The diesel we're driving produces less power and torque than the Polo  68PS@3800rpm and 170Nm@1800-2400rpm. 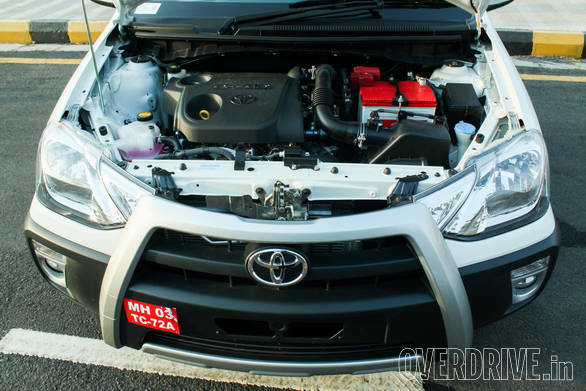 However the Toyota engine has the advantage of one more cylinder and a further 165cc of displacement. The Etios Cross instantly feels more tractable with a stronger mid range which allows you to hold a higher gear than the VW would allow in a similar situation. This and the precise gearbox (the Polo's feels rubbery in comparison) make the Toyota a much easier and nicer car to drive in general. The Etios is quicker too, thanks to a weight saving of over 100kg. The Etios Cross hits 100kmph in 15.6 seconds and is more efficient as well returning 17.9kmpl overall. The Cross Polo, like its sibling offers a good compromise between ride and handling. The suspension is on the softer side and handles rough roads well. However it does have a tendency to crash through bad potholes. Straight-line stability is good and the electric steering feels light and direct but rather inert. The Polo offers you no reason to crib over bad roads or celebrate over the good ones  it simply gets the job done efficiently well. Jump into to the Cross Etios after the VW and it immediately feels softer. The car has the same tendency to nose dive under hard braking like the Cross Polo but it also has slightly more body roll. Once you get used to this you realise the Etios Cross offers plenty of grip and can be a surprisingly fun car to pitch around. Ride quality is great and the Etios Cross does a better job of ironing out the worst of our roads. Cars like these aren't bought for their off-road ability or mechanical superiority over their siblings. As far as we can tell, the only reason a customer would choose an Etios Cross or a Cross Polo over the standard models is if they want to stand out. The Cross Polo doesn't do that as well as the Toyota. 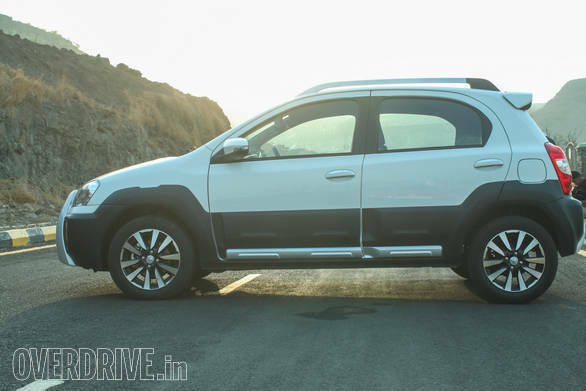 I personally prefer its subtle but rugged looks over the Etios Cross' loud exterior, but I seem to be in the minority. There's no doubt that the VW feels more premium, especially on the insides and it is a better built car. It also offers a few more features like electrically adjustable mirrors and auto up and down for all four windows. But it's also far more expensive at Rs 9.25 lakh on-road Mumbai. The Rs 66,000 premium over the Rs 8.59 lakh Etios Cross is only the beginning  Volkswagens are expensive cars to own. The first paid services for VWs often runs over Rs 20,000. Toyotas are traditionally more affordable cars to maintain. The Etios Cross also offers better performance, ease of driving and better mileage as well as choice of three engines. It's a more spacious car and has great ride quality. But most of all  it stands out. That perhaps explains why I have seen more Etios Cross' on the road in one month than I've seen Cross Polos in a year. 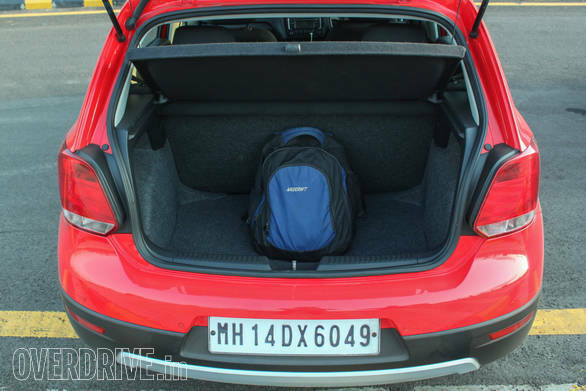 If you must have a ruggedised hatch back, the Etios Cross is the better choice.